Next, each player receives five silver coins, one crown and one castle. Place the remaining components in a separate area next to the board. This is the reserve. (Keep your army units in an area near you - this is called your army reserve). Bid to place first and go first by secretly selecting a number of coins from your initial five coins and holding out your bid in a closed fist. All players will then reveal their bids at the same time. The highest bidder pays his or her bid to the reserve and receives the First Player Marker. Players who did not win the bid keep their coins. The highest bidder places his or her kingdom on the gameboard first and will start each round as long as he or she controls the First Player Marker. Note: In the case of a tied bid, roll dice to determine who receives the First Player Marker. The highest roll wins. Now it's time for players to place their kingdoms on the gameboard. Starting with the first player and passing to the left, each player will carry out all kingdom placement steps before the next player places their kingdom. (See page 7 for the kingdom placement steps). Once all players have placed their kingdoms, the first round will begin. Note: Players may want to review the City Bonus Tiles to help decide where they would like to place their kingdom. 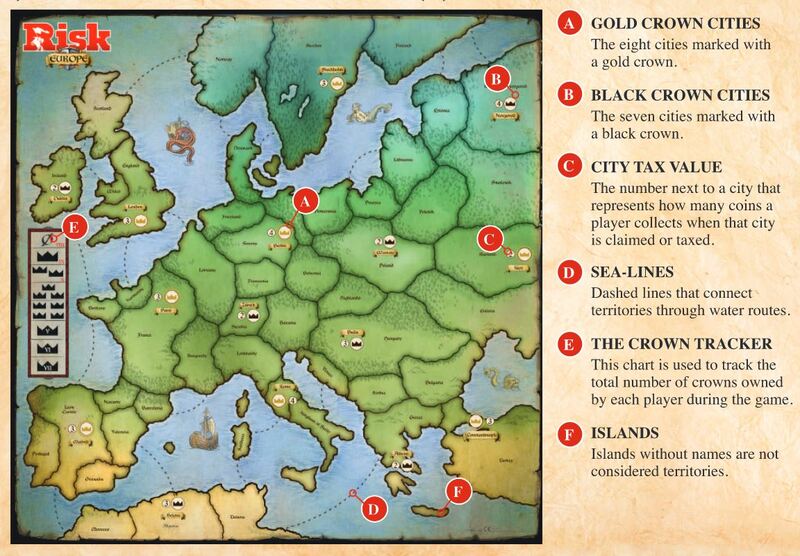 Select one of the eight Gold Crown Cities on the gameboard and place your crown and castle on that city territory. Be sure to collect the city's Bonus Tile and Tax Value in coins from the reserve. (The Tax Value is collected as a bonus each time you place a crown on a city). Place your War Banner on the first space on the Crown Tracker located along the side of the gameboard (place it on the second space if you selected Rome as your starting city). Finally, place ten Footmen, divided in any way you like, between your starting city territory and one adjacent non-city territory. At the beginning of the game, each player will have all eight of their King's Orders cards in hand and will choose two of those cards to play during that round. After the cards are played, they are discarded and each player will start the following round with two fewer cards to select from. After a card is revealed, a player chooses one of the two orders available to play. That player may also carry out any bonus actions or city bonuses that might take effect during that turn. When you run out of cards, simply return all eight of your cards from your discard pile to your hand. This will happen at the beginning of every fifth round. Each player secretly selects two cards from his or her hand and places them face down on the table in a stack before Turn 1 of the round starts (each player will have his or her own separate stack of two cards). The top card will be used for Turn 1 and the bottom card will be used for Turn 2. Note: These cards cannot be reordered once placed, so choose the order carefully! Turn 1: The first player turns over his or her top card, selects an order, announces it and carries out that order's action. Play passes to the left and each player does the same in clockwise turn order. Turn 2: Each player now carries out an order selected from his or her bottom card in the same turn order as Turn 1. After all players have played both their cards, battles in disputed territories must be resolved. (Be sure to adjust the War Banners after each battle if crowns change hands as a result of that battle). The two cards each player revealed in this round are discarded into that player's personal discard pile. A round is over only after each player has revealed two cards, played two orders and all battles have been resolved. If, at the end of a round, one player controls seven or more crowns, the game ends and that player wins. Otherwise, the next round begins. Note: If a player is unable or chooses not to carry out any actions on a revealed card, that card is still put in his or her discard pile at the end of the round. Note: If the First Player Marker changes hands during the round, the next round will start with the player who is now in control of the First Player Marker. To win the game, you need to control seven or more crowns at the end of a round. Here are the three ways you can collect additional crowns during the game. You may use your army to expand into an unclaimed city territory to take control of that city and gain its crown(s). Place a crown from the reserve on the city territory. Collect the city's Tax Value in coins from the reserve as a bonus for being the first player to place a crown on that city. (You also gain control of the city's City Bonus Tile if it is a Gold Crown City). Move your War Banner forward on the Crown Tracker. You may also take over an opponent's city by expanding your army into that player's city territory and defeating that player's army in battle at the end of the round. If you win the battle and take over another player's city territory, your War Banner advances on the Crown Tracker and your opponent's War Banner falls back. Note: A tax bonus is not collected when taking over another player's city in battle. You may also use coins to purchase a crown card during a round. Purchasing a crown card is a show of power and will instantly move your War Banner forward one space on the Crown Tracker. You control your kingdom and your army by issuing King's Orders. When choosing King's Orders cards to play for the round, choose from the following options: Expand, Split Expand, Manoeuvre, Spend and Tax. Expand orders are how you claim new territories and attack your opponents' territories to increase the size of your kingdom. If you expand into an opponent's territory, it becomes a disputed territory and will result in a battle at the end of the round. Only the defending player may expand out of a disputed territory. However, that player must leave behind army units equal in number to the attacker's army. If an opponent's territory contains a castle, you may not expand into that territory unless your expanding army contains a Siege Weapon. 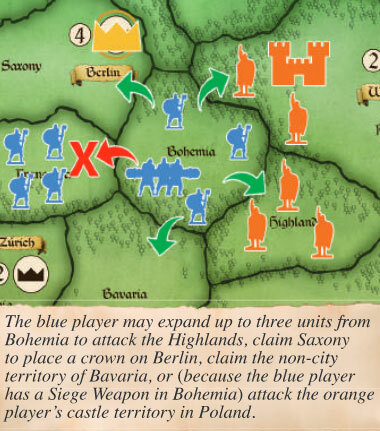 A third player's army may not enter a disputed territory for any reason. 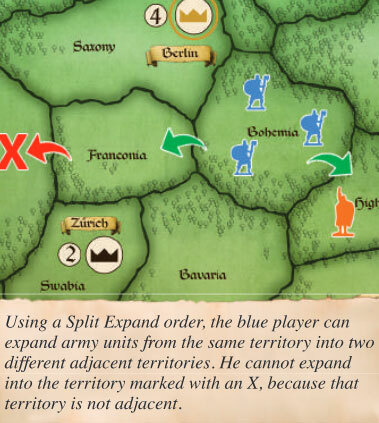 You may not use an expand order to move army units into either a territory already in dispute or a territory already under your control; you must use the Manoeuvre order for these types of actions. Move any number of your army units from one territory you control into one adjacent territory that is either unclaimed or occupied by an opponent's army. You must leave at least one army unit in the original territory when expanding your kingdom. Move any number of your army units from a territory you control into up to two adjacent territories that are either unclaimed or occupied by an opponent's army. Both territories must be adjacent to the original territory, and you must leave at least one army unit in the original territory. Manoeuvre orders are how you move your army units through your kingdom and help reinforce disputed territories connected to your supply lines. Supply lines are any series of territories under your control that are connected to each other by shared borders and/or sea-lines. 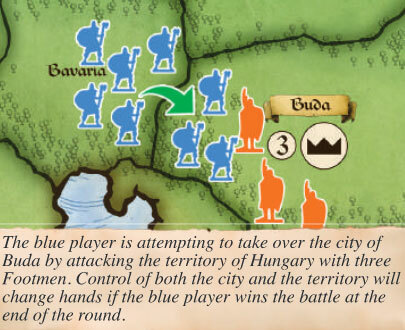 Note: Players may manoeuvre all their army units out of a non-city territory if they choose to do so, but they must leave behind one army unit when leaving city and castle territories. Relocate any number of army units from one territory you control to one other territory (up to two territories away) already under your control or in dispute. The army units you relocate must move through territories already under your control and must stop and forfeit any remaining movement if they enter a disputed territory. Army units are not allowed to retreat from battle once committed. 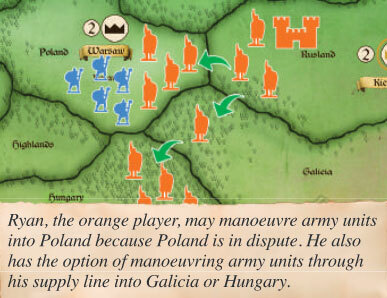 Therefore players may not manoeuvre army units out of a disputed territory for any reason. Taxing your territories is the main way to collect additional coins. You can later spend these coins to make purchases for your kingdom. This card allows you to spend your coins to make purchases that strengthen your kingdom. You may spend coins to recruit new army units, build castles and buy crown cards. Spent coins are returned to the reserve. Select a city territory you control, then collect the Tax Value of that city and all other cities and non-city territories you control that are connected to that city through supply lines. You receive the full Tax Value of each city territory connected to the city you choose to tax, and one additional coin for each non-city territory connected to the city you choose to tax. Important: Tax is not collected from any disputed territories in your supply line. Furthermore, disputed territories have the power to break apart your kingdom into multiple, smaller supply lines. When a disputed territory breaks apart your kingdom, the disconnected areas may be worth different numbers of coins, so choose the city you want to tax carefully! Some King's Orders cards also have bonus actions available at the top. Bonus actions are extra abilities you perform in addition to the order you choose on your card. Bonus actions may be used before or after you carry out the order you've selected for that turn. When this action is revealed, you immediately take control of the First Player Marker. Multiple players can play the King Me action in the same round. The player who controls the First Player Marker after all cards have been played will start the next round. The First Player Marker changes hands only when someone reveals the King Me action. 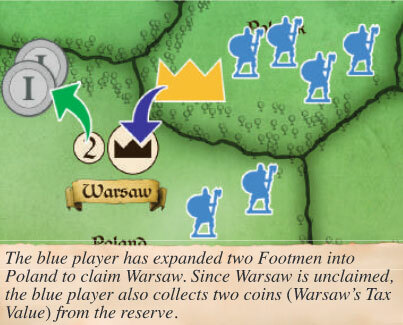 Add three Footmen to a city territory you control or four Footmen to a castle territory you control. This action may be used in a disputed city or castle territory only if you are the defending player. Select a territory you control that contains one or more Siege Weapons. These units attack one adjacent enemy territory by rolling two dice for each Siege Weapon present. For each die value of 3 or greater, the opponent removes one army unit of his or her choice. (No defence dice are rolled). Notes and restrictions: Siege Assaults are limited to adjacent land territories and may not be used across sea-lines. You also may not use Siege Assaults from disputed territories or into disputed territories. If you do not control any Siege Weapons at the time the card is revealed, simply ignore the Siege Assault bonus action and carry out the rest of your turn as usual. This section covers the three types of items you can purchase when using a spend order. The spend order allows you to purchase new army units of any type and in any quantity that you can afford. 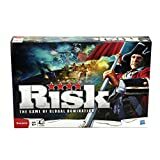 All army units must be placed on the gameboard when purchased and may only be placed in city territories and/or castle territories that you control. You may disperse purchased army units in any way you choose; they do not all have to go into the same city or castle territory. You may never purchase more army units than you have physically available in your army reserve. Purchased army units cannot be placed in disputed territories. Army units lost in battle are returned to your army reserve and may be purchased again during later turns. The spend order also gives you the option of building a castle in any territory you control to boost that territory's defences. Protection - Castle territories cannot be attacked unless the attacking army has a Siege Weapon in it when it expands. Remote Recruitment - You may recruit army units into a non-city territory by building a castle in that territory first. Castle Defence - The defending player may re-roll all dice of one rank each time the Ranked Attack Order is repeated in battle. (See page 16 for more information about the Ranked Attack Order). Castles cannot be destroyed, but other players can take them over by winning a battle in the territory. Castles in unclaimed territories can be claimed by expanding into that territory with any army unit. You cannot build a castle in a territory that is in dispute. You may not build more than one castle in any one territory. Once all castles have been purchased from the reserve, no more castles can be built for the remainder of the game. The third way you can spend coins is by purchasing a crown card from the reserve. You may purchase only one crown card per round and only eight are available for purchase during a game. Buying a crown card permanently increases your War Banner's position on the Crown Tracker by one space forward. Each player is limited to one crown card purchase per round (even if spend orders are played for both turns). Place purchased crown cards in front of you, crown-side up, next to the gameboard and in clear view. 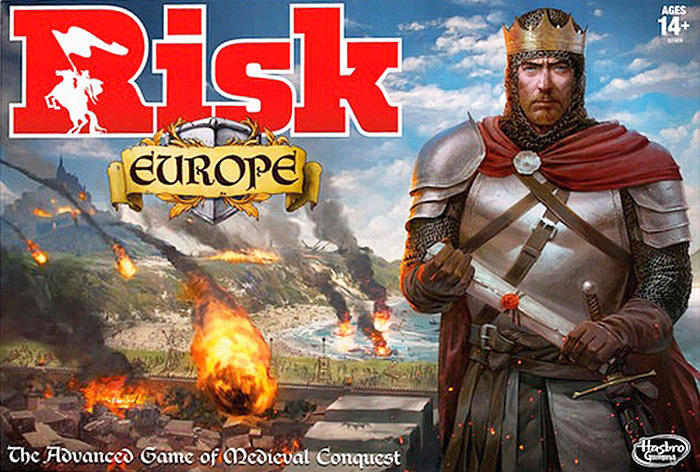 The missions and bonuses on the back of the cards are used for the Kingdom Missions variant found on page 19; these are ignored for the Basic Game. This section covers where and when the battles happen and how to resolve those battles. When a player expands into another player's territory, that territory is considered to be in dispute. 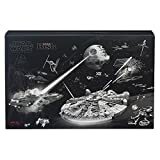 This will result in a battle at the end of the round, and the outcome of the battle will determine who controls that territory and its contents. The player who has the First Player Marker after everyone has played their two cards is allowed to choose the order in which all battles resolve at the end of the round. 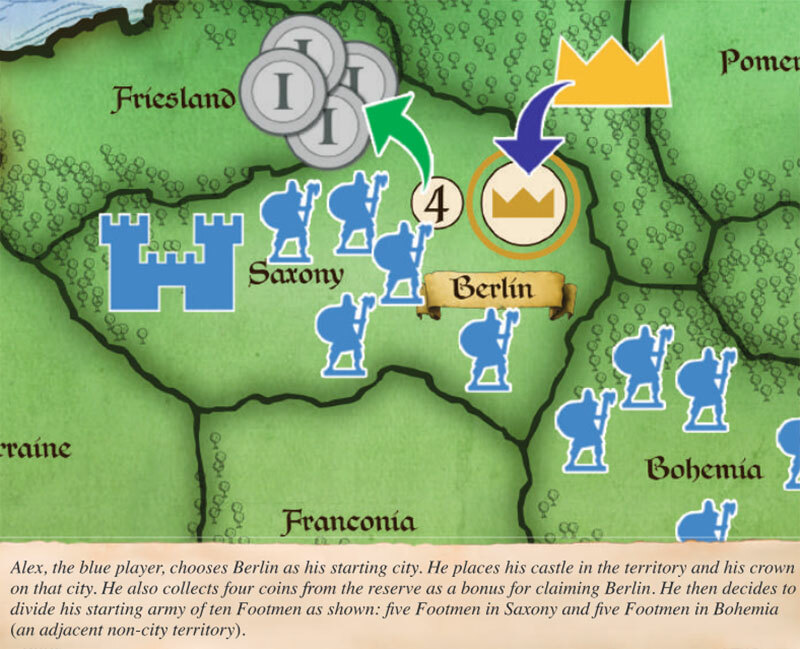 In a disputed territory, the defending player retains control of any city or castle that may be present until the battle is over. 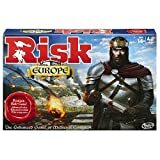 The player who wins the battle not only gains control of the territory, but also takes control of any city or castle that be present as well. Attacking Player: The player who enters a territory under another player's control is considered the attacking player. Defending Player: The player who controlled a territory before it was attacked is the defending player. Using an Expand order to attack another player's territory will always result in a battle at the end of the round; players are not allowed to retreat from battle for any reason. Only two players may have army units in a disputed territory. 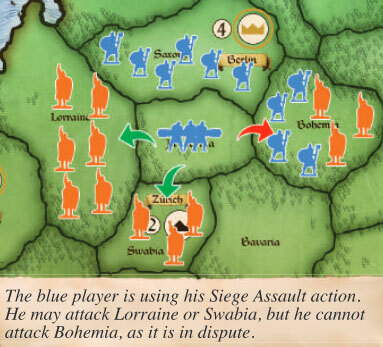 A third player's army cannot enter a disputed territory for any reason. It is possible for a player to be involved in multiple battles-with different players at the end of the same round. Players attack each other by rolling dice for each of the different army unit types under their control in a disputed territory. Both players always roll for these attacks simultaneously and in the same order: Siege Weapons, Archers, Cavalry and then a General Attack by each army. These four sequential attacks are known as the Ranked Attack Order. Both players repeat this order as many times as needed until one army is eliminated from the disputed territory. 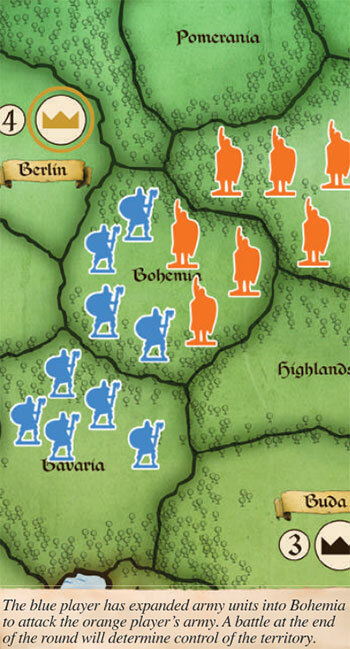 To roll for the attacks in Ranks 1, 2 and 3, both players simply count up the total number of army units they have of that particular type in the disputed territory, then roll the appropriate number of dice for each of those units they control. Only one player will roll for a rank if only that player has units of that type in the disputed territory. Each die rolled that meets or exceeds the unit type's 'Hits On' number automatically scores a hit against the other player's army that can't be prevented. Since both players are rolling for each rank at the same time, it is possible for both armies to have hits marked against them at the same time. Each hit scored against an army reduces its army total by one unit (chosen by that army's owner). 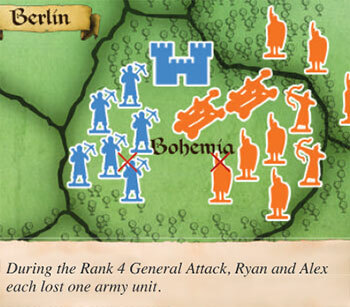 When either player's army has hits scored against it, units must be removed before both players may proceed to the next rank. If hits are scored in a battle that result in both armies being eliminated from the territory, the territory becomes unclaimed and any crowns present return to the reserve. If the defending player controls a castle in the disputed territory, that player may re-roll all dice of a single rank each time the Ranked Attack Order is repeated. To roll for the General Attack (Rank 4), the attacker and defender count up all their remaining army units of all types in the disputed territory and roll a preset number of dice. Then both players compare the highest values rolled. The number of dice rolled by each player may be different, and is determined by counting the total number of army units present in both armies in the disputed territory. Note: if both players only control Footmen in a disputed territory, both players need only repeat the Rank 4 attack until one army is eliminated. They will skip Ranks 1, 2 and 3. Scoring hits in the General Attack works differently from the first three ranks, and only a maximum of two hits can ever be scored during each General Attack. To score hits in the General Attack, roll the dice based on your army unit totals in the disputed territory and compare the highest die value rolled by each player - the player who rolled the higher of the two values scores a hit against the other player's army. Next, remove the two dice that were just compared. If each player rolled at least two dice, compare the highest values remaining between both players. Again, the higher of the two values will score a hit. In the General Attack, any time the attacker's and the defender's numbers are tied, only the defender scores a hit for that comparison. If both armies still have army units in the disputed territory after the General Attack is finished, the Ranked Attack Order starts again at Rank 1. The Ranked Attack Order must be repeated as many times as needed until one army is eliminated from the disputed territory. The first player to control 7 or more crowns at the end of a round after all battles are resolved wins the game! If two or more players are tied at the end of a round with seven or more crowns, the player with the most territories under his or her control wins. If a tie still remains, the player with the greatest number of coins wins. If one of the tied players also controls the First Player Marker, that player counts the marker as ten additional coins. Though unlikely, players can be completely eliminated from the game. This happens when a player no longer controls any city territories and his or her War Banner is reduced to the zero position on the Crown Tracker. 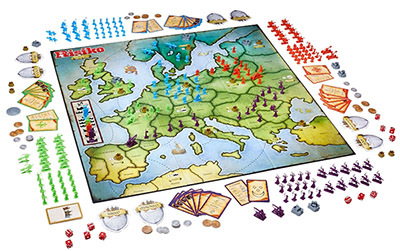 A player with no cities under his or her control at the end of the round is eliminated and must remove all of his or her army units from the gameboard and return his or her City Bonus Tiles and coins to the reserve. A player who does not control any city territories but owns at least one crown card may still participate in one additional round to try to reclaim a city territory to stay in the game. Players without city territories forfeit the ability to tax until they reclaim a city territory. Players who do not control any cities may still recruit army units, but only if they control a castle territory. If a player fails to reclaim a city territory at the end of the following round, that player is eliminated from the game. The eliminated player's crown card(s) are removed from the game and are NOT returned to the reserve. 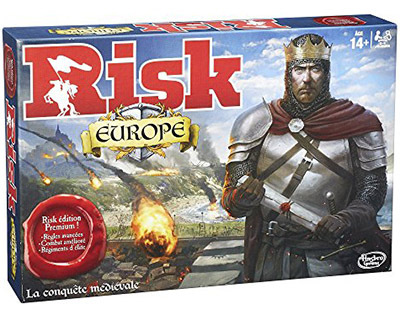 Check here for variants of Risk: Europe.